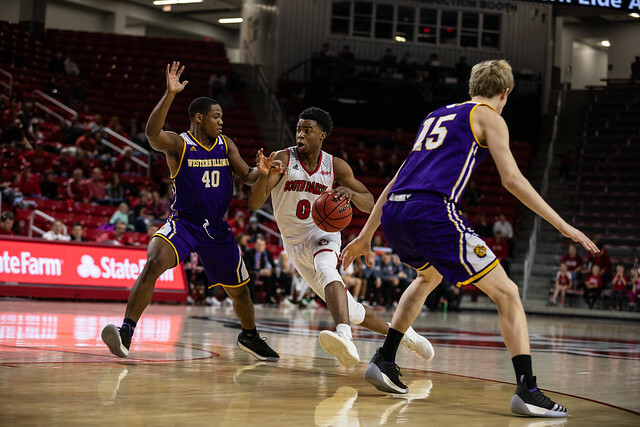 The Vermillion chill seeped into the Sanford Coyote Sports Center Saturday night, where a seven-minute scoring hiatus from the Coyote men’s basketball team ended in a 65-59 loss to Western Illinois. Junior Triston Simpson led all scorers with 17 points on 6-for-13 shooting and added six rebounds. Senior Trey Burch-Manning, in his first home game since Dec. 21, scored 14 points on 5-for-15 shooting and five rebounds in 31 minutes of play. Junior Tyler Peterson compiled eight points and led the Coyotes with 12 rebounds. 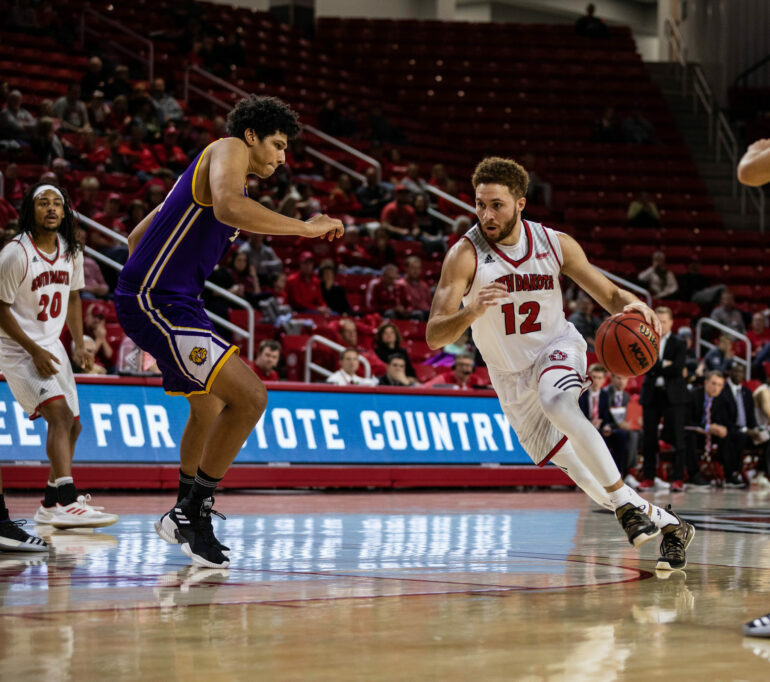 USD retained a comfortable lead over the first part of the second half—reaching 11 at 10:52—but over the next seven minutes, the Coyotes went scoreless in 10 straight possessions, and WIU fought back to a 55-50 lead with five minutes remaining. Simpson broke the cold streak with a layup just after the four-minute mark, and a three from Junior Cody Kelley on the following possession tied the game at 55. However, a three-pointer from sophomore Kobe Webster, the Leathernecks’ leading scorer (17.9 points per game), with 50 seconds left gave WIU a five-point lead, and the Coyotes couldn’t battle back in time. After falling behind 17-11 in the first half, USD used a 10-2 run to take the lead and went into halftime up 31-26. The Coyotes held the Leathernecks to 35 percent shooting in the first half. The two teams swapped shooting leverage in the second half, WIU hitting 12-of-24 and USD hitting 10-of-30. WIU freshman guard Ben Pyle led the Leathernecks with 15 points and ten rebounds, followed by Webster with 13 and junior C.J. Duff with 11. The presence of WIU’s senior seven-foot forward Brandon Gilbeck, who leads the nation with 80 blocks, forced USD to take attempts outside of the lane. “Gilbeck’s a handful for us to guard, but I think offensively the biggest difference for us is shooting 37 percent at home,” Lee said. Saturday’s game was the Coyotes’ first home game in 13 days, ending a three-day road trip that started in Tulsa, Okla. and ended in Grand Forks, N.D.
Lee said prior to the season, both him and Dawn [Plitzuweit] tried to change the schedule due to concerns over workload. The Coyotes welcomed back Burch-Manning Thursday against North Dakota. He had missed the last four games to a stress fracture in his foot. Burch-Manning shot 4-for-11 from beyond the arc against WIU, more than doubling his season-high six three-point attempts early in the season. Burch-Manning said he’s trying to rid himself of the rust on the offensive end of the court. “I’m probably not as locked in fully like I was in the earlier half of the season. But it’s basketball, I’ve been playing it for a long time so I just got to get back into it,” he said. The 6-foot-6 forward, who led the Coyotes with 12.9 points per game before his injury, said the “embarrassing” loss should play as motivation to rebound. The Coyotes hop back on the road to Purdue Fort-Wayne for a rematch against the Mastodons (13-10, 5-3) on Wednesday at 6 p.m.